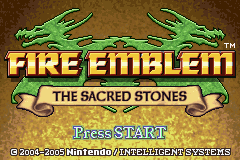 The Fire Emblem games are a fantasy series created by Nintendo and they always seem to be overshadowed by The Legend of Zelda games, the majority of people, I imagine, only knowing about the game due to the Smash Bros. series. This is a real shame. Recently I’ve managed to play through this game and I’ve honestly really enjoyed it. The gameplay is a combination of turn-based strategy and RPG. In every level you are put on a map featuring several enemies and buildings and you are given an objective. Unlike most strategy games, however, you do not just hire hoards and hoards of unnamed soldiers, instead you can only use the characters you meet throughout the story and if they die, that’s it, they’re gone. The fact that characters can actually die gives you more motivation to win every level without anybody dying and, trust me, every time one of the game’s heroes does die, you’re going to feel quite guilty about it. The storyline of this game is probably one of the most developed stories of all the games I’ve ever played, so I’ll just say that it all starts with a peaceful continent being thrown into mayhem when one of its nations invades another. In fact, the story of this is so long and well thought out, that it’s probably just as deep as some novels I’ve read. There are several very long cut scenes, all of them containing a lot of dialogue to read. This could potentially be a downside to some people due to the possibility of it getting boring, but I, for one, had no such problem. Every character has their own backstory and personality too, my personal favourite was a girl named Lute and she doesn’t even have a big role in the story, so I guess this shows how well they come across. So, on the whole, as you take control of Eirika and Ephraim (the game’s two main heroes, if either of these die, it’s game over) you are embarking on a truly epic quest! When the game ends, you’re free to wander around the map and fight roaming monsters if you like, and as well as that there is a huge task called the ‘Creature Campaign’ to do where you have to work your way up a tower, which sounds boring but is actually a lot of fun and you are rewarded with some worthy unlockables. It found it to be a very engaging, compelling and rewarding game.